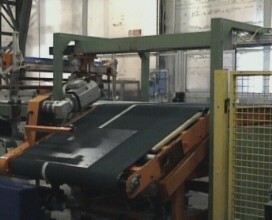 Following many years of experience in design and manufacturing of machinery of the tire and rubber industry and, in particular, in manufacturing of automatic Tire Building Machines and Air Springs Building Machines, INTEREUROPEAN has developed a new fully automatic “INTERTECH” Uni-Stage Building System for manufacturing of air springs, used in air suspension systems of all modern trucks and buses. The semi-finished components used for production of air springs are very similar to those used for manufacturing of tires (rubber innerliner, textile piles, beads etc. ), so it was relatively easy for the company to adapt the existing automatic servicers designs for tire building machines for use on the high performance air springs building system. The new machine is designed to produce 1 finished green air spring in 20 seconds in fully automatic mode. All the components are centered by the active guiding systems, pre-cut to length and automatically applied on the carcass drums according to the pre-set splice offset distance and recipe settings. Twin carcass drums provide for optimum cycle time distribution between components application on one drum and dynamic stitching + unloading by manipulator on the other drum. 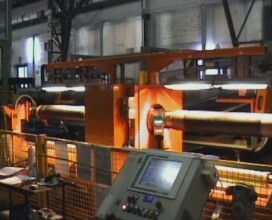 Two dedicated bead setting and turn-up stations are connected to the carcass building station by means of automatic manipulators, travelling high speed guides. The specially designed transfer devices pick-up the air spring carcass from the carcass drum and transfer it to the corresponding turn-up station on both sides of the system. 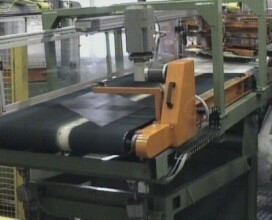 Positioning of the carcass inside the turn-up station is executed automatically by the manipulator, while special center lock device keeps it in position during the bead setting and turn-up operations. The same manipulator removes the finished green air spring from the turn-up station after bead setting and mechanical turn-up operations and brings it to the unloading station on its way back to the carcass drum for picking up a new carcass. The finished green air springs from both turn-up stations are automatically unloaded by manipulators directly to the storage trucks for further transportation to the curing presses. Material application on the drums is controlled by special cameras and sensors in automatic mode, while material centering in the servicers is handled by active guiding systems. The system requires 1 operator for supervision of automatic operation and two robots, one for each of the two turn-up stations, for bead setting. The service personnel required to run the system is 1-2 people. Their main functions are material spool replacements, air springs carrying trucks feeding to the system and beads carrying trucks feeding to the robots. INTEREUROPEAN’s “INTERTECH” Air Springs Building System can be used for manufacturing conical and cylindrical type air springs, simply selecting the proper air spring type from the menu, with an output of more than 3.000 air springs per day, or more than 1 million air springs per year from a single automatic system. The overall footprint of the INTERTECH system is 10 x 20 meters. Various configuration options and size ranges are available upon request, including complete integration of the INTERTECH system into the main plant supervision system for online remote monitoring and receipts uploading. Advanced control components and software allow INTEREUROPEAN engineers to connect via internet to the machine for diagnostics and real time troubleshooting, if required. Each material let-off station is provided with two sets of let-off carriages, allowing for off-line bobbin changing and quick carriage replacement, reducing to minimum the machine downtime. The estimated complete size change time is around 30 minutes with 3 operators.